Startup Eyedea announced Tuesday that it will be releasing Pitta, a video recognition-based, automatic-tracking selfie drone, in the second half of 2017. Independently developed by Eyedea, Pitta is a drone that can automatically track a user or any other specified target while filming and/or transmitting other data. The device is ideal for beginners because it can be controlled via a mobile application rather than a separate remote control. 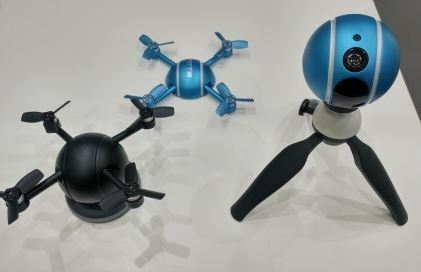 It is equipped with advanced video recording effects (panorama, time slip and slow motion) and has been designed so that a camera unit can be detached for portability or for use as a stand-alone device. The updated model, which is scheduled for release in 2018, will be equipped with simultaneous localization and mapping as well as artificial intelligence technologies. SLAM is a real-time location-tracking and map-drawing technology that allows the drone to avoid obstacles during free flight, while AI deep-learning technology gives it the capability to classify, recognize, and track objects. Following its domestic release in the second half of 2017, Eyedea plans to release its products in the United States, which occupies over 30 percent of the global drone market. Eyedea receives support for its overseas marketing activities from the K-ICT Born2Global Centre, an organization affiliated with the Ministry of Science, ICT and Future Planning.